There’s no denying that Germany is arguably the beer capital of the world. Enthusiastic tourists have been flocking here for years to take part in beer festivals and to indulge in the iconic German beer culture. Whether you prefer helles (light in color, not calories), dunkles (dark), or Heffeweizen (yeasty wheat-based), Berlin is home to several local, regional and foreign beers served either on tap, in a can or in a bottle. 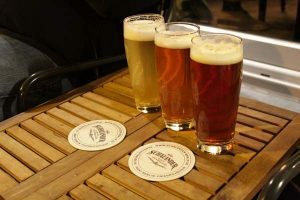 In addition to traditional beers that have been available in Berlin’s bars for decades, the city is now witnessing the sudden emergence of the craft beer scene which has facilitated the opportunity for skilled brewers to come here from around the world, namely North America, to shake things up and diversify the age-old Berlin beer landscape. Exploring this landscape, however, can be overwhelming as Berlin is flooded with a mixture of trashy, ordinary and upscale bars from the city center to deep into its outer districts. This is where our expert guides and beer enthusiasts can help. They will take you on a first hand journey to some of their favorite spots and introduce you to some of the loveliest neighborhoods that can only truly be found with the help of a local. Each guide leads his or her own unique tour, so be sure to specify exactly what you’re looking for, and don’t forget to say Prost! (cheers!) before taking that first sip!